With almost 30 separate processing modules available, McDSP’s 6050 promises to be the “ultimate channel strip”. Is it? McDSP’s principal developer Colin McDowell has been in the game longer than most, and if there’s such a thing as a classic plug-in, his FilterBank and CompressorBank definitely belong in that category. Originally stalwarts of the Pro Tools TDM world, both are now available on all major native formats on both Mac OS and Windows. Both are also deceptively powerful, with configuration options that allow them to mimic the behaviour of a wide range of vintage hardware units, as well as to create powerful original designs. However, the controls that make this power available perhaps represent too much complication for some, and there’s also the undeniable fact that many of us mix as much with our eyes as with our ears. No matter how sonically faithful it is to the original, calling up a Fairchild preset in a generic compressor plug-in just isn’t the same as opening a big grey window and adjusting the faux Bakelite controls until the needle on a fake VU meter moves just right! With these concerns in mind, Colin and his team have now drawn on their many years of development experience to create a series of plug-ins that embody the sonic virtues of FilterBank and CompressorBank within a very different interface. Like Slate Digital’s Virtual Mix Rack, the 6020 Ultimate EQ, 6030 Ultimate Compressor and the 6050 Ultimate Channel Strip draw their inspiration from the popular 500-series ‘Lunchbox’ modular format for hardware processors. In the case of 6020 and 6030, a single plug-in can take on the characteristics of your choice of 10 different equalisers or compressors, depending on which module is selected from the list at the left. The 6050 Ultimate Channel Strip, the subject of this review, is truly modular; its three ‘slots’ can host any of the compressor and EQ modules available to the other two plug-ins, plus a selection of ‘other’ modules which currently includes gates, expanders and saturation processors. Authorised using the iLok system, it’s available on Mac OS and Windows, in all common native formats, and also in AAX DSP format — a welcome bonus which will make it all the more tempting for Pro Tools HDX owners. It’s clear that the main focus behind these plug-ins is ease of use, and there are lots of nice touches to the 6050 user interface to help you get results as fast as possible. One of three console-style buttons illuminates to show which of the three modules is the ‘target’; replacing this module is then simply a matter of choosing an option from within the Module Selector list. What’s really neat is that when you use this list to switch from one EQ or compressor module to another, the settings are maintained as closely as the controls of the new EQ or compressor will allow, making it easy to compare what the idiosyncracies of individual modules are contributing sonically to the mix. Clicking and dragging allows modules to be reordered, but the modules retain their numbering regardless of order. The three slots are bookended by input and output modules with their own gain controls and meters; the former also provides individual side-chain enable and listen buttons for each module. (In other words, like most plug-ins, this one accepts a single side-chain signal from the host DAW, but you can choose which modules hear it.) Preset loading and saving applies to the plug-in as a whole, and it’s not possible to save and load presets for individual modules. The factory presets are themed according to instrument, and are generally of a high standard. As plug-in user interfaces go, then, this is one of the simplest and most satisfying I’ve encountered in quite a while. If I have one criticism, it’s that when choosing modules, you only have the module name to go on; and since many of these names are fairly cryptic, it can be a while before you reliably associate the name with the relevant module. It’d be friendlier still if you could choose using miniature graphical versions of the module interfaces, as you can for example in SoundToys’ Effect Rack. The modules themselves are clear, colourful and slightly cartoon-like in appearance. Some of them borrow obvious visual cues from vintage hardware, but none are merely a simulacrum of a physical unit. Pretty much all the parameters are set using rotary controls; these often bear little by way of calibration markings, but when you click and turn one, a pop-up numerical window tells you the precise setting. Turning first to the EQ section, many of the 12 designs on offer are inspired by vintage units, but the emphasis is on general sonic flavour rather than slavish emulation. So, for example, the ‘British E’ module is described as “an amalgamation of great Neve equalisers”, while the EQ’76 is loosely based on the Urei 545, but neither offers exactly the same configuration of controls. In a couple of cases, McDSP have even emulated imaginary hardware units, with the EZ Q module for example being described as the classic equaliser that dbx never built! Perhaps the most unusual device in this category is the MEF1 “mid emphasis filter”, which does exactly what it says on the tin, but my favourite is the E670. Modelled after the little-known Fairchild 664 equaliser, it pairs high- and low-frequency shelves with a mid-range band that excels at adding bite and punch without ever getting harsh. Nearly every band of every module in the EQ section has gain cut/boost and frequency controls. However, only the E404 module has a Q or bandwidth control, meaning that the others can’t truly be described as ‘parametric’, at least in my book. Because they’re imitating different hardware originals, the various modules do have different bandwidth settings and levels of Q/gain interaction, but none of this is reflected in any way in the user interface, so you need to be willing to trust your ears. From the point of view of keeping things simple, not to mention that of recreating the experience of using hardware EQs that don’t have Q controls, I can understand the decision to omit them, but personally, I’d have liked the ability to adjust parameters such as bandwidth and filter slope, at least in some cases. By contrast, many of the compressor modules boast the full complement of basic dynamics controls: attack and release times, ratio and threshold, plus make-up gain. Where they don’t, it’s because they are mimicking the behaviour of less lavishly equipped hardware units, as in the C671 Fairchild emulation, or the Opto-C2 and Opto-L2 modules, which respectively replicate the Compress and Limit modes in the Teletronix LA2A. Many of them also have subtle control or programme dependencies hard-wired; for instance, McDSP’s “all original” iC2 module automatically adjusts its time constants in response to the other settings, while the vari-mu-style MT2’s “output frequency response is variable based on the amount of compression”. Together, the 10 modules run the full gamut of compressor ‘sounds’, from the gentle persuasion of MT2 and iC2, through the smoothness of Over EZ and the opto models, to the more direct approach of the “traditional British” BC-22 and the downright hairy D358, which seems to owe something to the Smart C2. In terms of basic compression duties, it’s hard to think of a base that’s not covered. However, the ‘keep it simple’ design approach does mean that some slightly more sophisticated techniques are excluded. Although the compressor modules can easily be made to respond either to the input signal or to an external side-chain input, it’s not possible to apply any equalisation to the side-chain signal without that becoming the main output. The upshot of this is that there are quite a few well-known applications for dynamics units which can’t be set up using a single instance of 6050. For instance, you can’t apply a high-frequency boost in the side-chain signal to make the compressor respond only to vocal sibilants and thus become a de-esser; nor is it possible to roll off bass from the side-chain signal to ensure that a mix bus compressor doesn’t over-react to low-frequency information. Once again, this latter omission is mitigated by the fact that the different compressor modules react differently in any case, but it does seem odd to me that it’s not possible to route an EQ module into the side-chain, as this hardly an esoteric technique. Finally, rounding off the collection is a group of six modules categorised as ‘other’. These include a gate and two expanders, all of which seem to do their job very well, along with three different flavours of saturation and distortion that are eminently usable for roughing up individual tracks, but perhaps not subtle enough to replace a console or tape emulator. 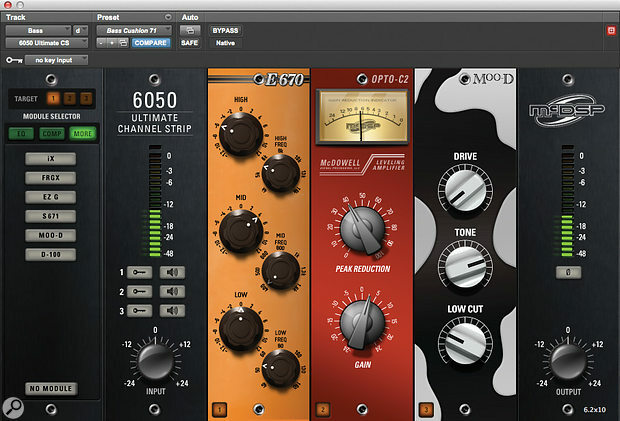 You could argue that McDSP have issued a hostage to fortune by calling 6050 the “ultimate channel strip”, because it certainly isn’t the most heavily featured plug-in of its type. As I’ve already mentioned, there’s almost no user control over EQ bandwidth, nor any ability to insert equalisation into the compressor side-chain. Moreover, although 6050 has more EQ and compressor modules than you can shake a stick at, it lacks a de-esser, and were I to design an “ultimate” channel strip, I’d probably want to include more unusual processes such as transient shaping. Some limitations on flexibility are perhaps inevitable in a plug-in that’s coded to work within the AAX DSP environment as well as in native formats, but in any case, to complain too strongly about absent features would be to miss the point of this plug-in. If you want the ability to endlessly tinker with compressor side-chain parameters and EQ responses, McDSP have had that covered for donkey’s years, thanks to the original CompressorBank and FilterBank. The point of 6050 is to give a new and more immediate focus to the same technology. This is not a plug-in that caters to every conceivable application for EQ and dynamics processing, no matter how specialised and obscure: it’s a plug-in that aims to streamline the most typical uses for them, and this it does very well. The well thought-out user interface makes it a pleasure to use, and although the control set might be limited in some ways, it’s hard to make this plug-in sound bad. If you’re one of those people who mourns the immediacy of mixing on an analogue console, where you can simply grab knobs and start tweaking, this is definitely a product that will brighten your day. The obvious alternative, also inspired by the 500-series world, is Slate Digital’s Virtual Mix Rack. A wide range of compressor and EQ modules that, taken together, cover a large sonic territory. Slick and immediate user interface. Available in AAX DSP as well as native formats. No bandwidth control on most of the EQ modules. Equalisation of the compressor side-chain signal isn’t possible. McDSP’s modular channel strip places the focus firmly on creating a fast and enjoyable user experience, and does so very effectively. $429 (AAX DSP plus native) or $329 (native only).